» How the Other Half Lives: Oregon’s Defense Is Better Than You Think, But Is It Good Enough to Stop Ohio State? How the Other Half Lives: Oregon’s Defense Is Better Than You Think, But Is It Good Enough to Stop Ohio State? Presumably, this is only one of many, many articles you’ll read this week about Oregon football — specifically, about the Ducks’ chances of beating Ohio State on January 12 for the school’s first national championship, the final step in its decadelong ascent into the sport’s upper crust — and like most of the others, this one is obliged to begin with the marvel of efficiency that is the Oregon offense. How could it not? By now, the relentless, up-tempo philosophy at the core of the Ducks’ rise enjoys a fixed place in the firmament, inescapable even to the sections of the country that have tended to view the entire Oregon gestalt (the spread, the perpetually evolving uniforms, the symbiotic relationship with Nike, etc.) as a harbinger of the gridiron apocalypse. The Ducks have been disparaged, dismissed, and denounced, but they keep scoring far too many points to be denied. For those of us who talk and write about the sport, the inevitability of Oregon’s offense is a kind of recurring theme accompanied by its own boilerplate, something like: Since 2007, Chip Kelly’s first year as offensive coordinator, Oregon has led its conference in scoring offense in [x] consecutive seasons. Including 2014, [x] now equals eight, an unparalleled streak that has endured through Kelly’s promotion to head coach and the passing of the reins to his in-house successor, Mark Helfrich. This season was also the fifth straight in which the Ducks eclipsed 500 yards and 45 points per game, placing them among the top five nationally in both categories all five years. Most recently, they’ve added a Heisman Trophy to the list and vanquished any lingering notion that the offense is “too soft” by burying Florida State beneath a 639-yard, 59-point avalanche in the Rose Bowl.1 The offense is the reason the Ducks are in position to play for a national crown, and if the decisive showdown with Ohio State goes according to script, the offense will be the reason they win it. What next for Oregon sans Mariota? But that was also the case the last time Oregon played for all the Tostitos, against Auburn in January 2011, and aside from gushing about the unflappable brilliance of quarterback Marcus Mariota — a subject we’ve covered here exhaustively — there hasn’t been a whole lot new to say about the Ducks’ offensive abundance in the meantime. Instead, we’re here today to shine a belated light on the Oregon defense: oft neglected, much maligned, and typically viable at best. By reputation, the Ducks D is the intractable Achilles’ heel of the operation, and the raw numbers this season have borne out that label. Under longtime assistant and first-year coordinator Don Pellum, Oregon has yielded more yards per game (421.9) than any team that has ever claimed a national championship, and more points per game (22.3) than 15 of the 16 outfits that won the title under the banner of the Bowl Championship Series.2 Within the Pac-12, arguably the most offensively oriented league in the nation in 2014, Oregon ranked in the middle of the pack in total defense and yards per play allowed and came in next-to-last when it came to stopping third-down conversions. At this particular point in the season, however, the raw numbers may not be giving Oregon enough credit for its ability to bend without breaking, or for hitting its stride at the right time. In their last two games, the Ducks have effectively clamped down in runaway wins over Arizona and Florida State, holding the Wildcats to a season-low 13 points in the Pac-12 championship game and FSU to just 20 points in last week’s semifinal round, matching the Seminoles’ worst output in two years. In fact, since the calendar turned to November, only one opposing offense (Utah’s) has managed to eclipse 20 points against Oregon. Throughout that six-game stretch, Pellum’s unit has been at its best: solid against the run, stingy in the red zone, and opportunistic against the only active quarterback with accolades to match Mariota’s. Meanwhile, the Ducks were also gashed in that span for 428 yards by Stanford, 440 by Utah, and 528 by Florida State, yields that, depending on the eye of the beholder, may be interpreted as ominous (the Cardinal, Utes, and Seminoles all exceeded their season averages for total offense by significant margins) or utterly irrelevant in the specific context of those games, all comfortable Oregon wins. Ultimately, any attempt to size up the Ducks’ chances on Monday night must wrestle with that divide: With one game to go, is there any relevant distinction between a defense that’s good and one that’s merely good enough? The most obvious caveat when assessing Oregon’s defense in terms of yardage is the sheer number of plays the Ducks have to defend as a result of their full-throttle philosophy on offense, which burns through clock and gives the ball right back to the opponent, albeit usually after an Oregon score: Including bowl games, only two other FBS defenses this season (Arizona and Bowling Green) have faced more plays. (For some comparison, although Oregon and Ohio State have both played 14 games, opposing offenses have run 123 more plays against the Ducks, the equivalent of nearly two additional games at the Buckeyes’ usual pace. 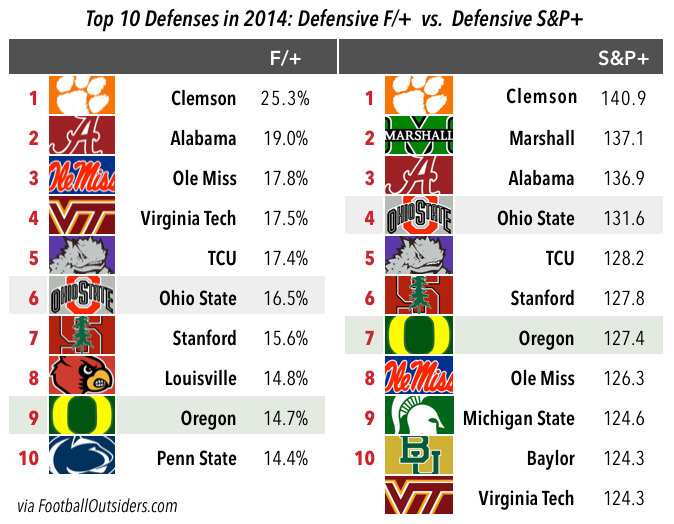 And OSU’s offense is not slow.) Adjusted for pace, Oregon fares much better in terms of yards allowed per play (56th nationally) than it does in yards per game (86th). The second caveat is that Oregon spends so much time operating with a comfortable lead, if not in outright garbage time, that large swaths of the stat sheet are effectively meaningless: 46 percent of the touchdowns and 43 percent of the total yards against Oregon this season have come with the Ducks already leading by at least 15 points. That’s a far cry from 86th in total defense, and it much more accurately reflects the experience of actually watching the Ducks play down the stretch, especially in the wins over Arizona and FSU. It also reflects their vastly improved athleticism along the line of scrimmage, where all three starters on the defensive line (juniors Arik Armstead, Alex Balducci, and DeForest Buckner) are former four- or five-star recruits and both outside linebacker/defensive end hybrids (senior Tony Washington and junior Christian French, another four-star recruit) have likely futures at the next level.4 The line of scrimmage was a glaring weakness for Oregon in the championship-game loss to Auburn, when the Tigers pounded out 254 yards rushing on 5.1 per carry; none of the four D-line starters in that game (Terrell Turner, Brandon Bair, Zac Clark, and Kenny Rowe) was drafted, and only Bair is on an NFL roster. No other position group on the team has come as far talent-wise in the intervening four years. Oregon has enjoyed a quality speed rusher or two over the years (Rowe, Dion Jordan), but it hasn’t previously boasted anyone capable of collapsing a pocket like that against a front like Florida State’s.5 That could be an issue for Ohio State, whose tackles were flat-out overpowered by Alabama’s pass rush in the Sugar Bowl on more than one occasion. The standard-issue stats may say the Ducks have only intermittently looked like a top-shelf defense, but the advanced stats say otherwise, and so do our eyes: More so than ever, they look like a top-shelf defense in terms of size, speed, and all-purpose nastiness. This is no longer a group that can be shoved around or outflanked simply because it doesn’t have the athletes to do anything about it. Whatever Ohio State gets, it will have to earn, exactly as it did against Alabama. The fact is, of course, that Ohio State did earn its gonzo output against the Crimson Tide, just as it did against Wisconsin in the Big Ten championship game, and against Michigan State a few weeks before that behind a different quarterback. Historically speaking, any expectation that Oregon’s defense should fare better than any of those outfits against a common opponent is far-fetched, and even in the context of the Ducks’ late defensive surge this year, limiting the Buckeyes to 20 points would constitute a Herculean effort. The secondary is thin minus Ekpre-Olomu, and if Ohio State can run for 281 yards on Alabama it can run on anyone, particularly a unit that ranked eighth in the Pac-12 in rushing defense. OSU’s offense is every bit the machine right now that Oregon’s has been for the last eight years. Obviously — breaking news here, I know — Mariota & Co. are going to have to score some points. Still, Oregon has always operated in that context. Although no one on the 2014 roster saw the field in the 2011 championship game,6 the defense is an unusually veteran group — 10 of 11 starters on the projected depth chart for Monday are in at least their third year in the program, and that doesn’t include the Ducks’ best pass-rusher (French, in his fourth year) or second-leading tackler (Derrick Malone Jr., in his fifth), two more upperclassmen who are technically listed as backups — and one that has adapted well to its role in a system designed for maximum speed, efficiency, and production on the other side of the ball. Nowhere is that more evident than in the defense’s penchant for creating turnovers: Oregon led the Pac-12 in takeaways this season for the third time in five years, combining with the mistake-averse offense to produce the best overall turnover margin in the nation. Takeaways turned out to be the overarching theme in the Rose Bowl, where the Ducks pulled away primarily by forcing five of them on Florida State’s first six possessions of the second half. Two of those set up the offense for quick touchdown drives in FSU territory; on another, as we’ve already seen, the defense took it to the house for a touchdown of its own. Ohio State is hardly immune to the turnover bug, and if the game does wind up being a shootout, stealing an extra possession or two could prove decisive. On the other hand, turnovers aren’t random gifts from heaven, and they’re much harder to come by in situations that aren’t also conducive to plain, old-fashioned defensive stops. 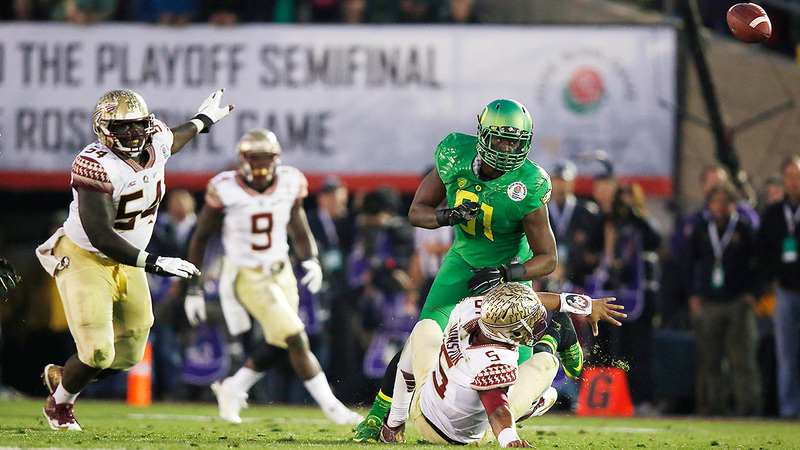 Oregon didn’t have many of those against Florida State, forcing just one punt while the game was still in doubt. Man for man, the Ducks match up more favorably with offenses like FSU’s and Ohio State’s than they ever have in the past, and down the stretch they’ve proven more adept than ever at slamming the door as their own offense pulls away. The win over Arizona was proof that this defense has the ability to dominate, and the Ducks flashed the same potential in the second half in Pasadena. But if winning a championship requires harnessing that potential on a consistent basis against Ohio State, the Ducks will need nothing less than their best defensive effort yet. Although, frankly, anyone who remained a dyed-in-the-wool skeptic after watching Oregon hang 46 points on Michigan State in September, 42 points on UCLA in October, and 45 points on Stanford in November may be a lost cause. The only exception in that span: the 2010 Auburn Tigers, who allowed 24.1 ppg en route to the title, but also managed to hold Oregon, the highest-scoring offense in the nation that season, to just 19 points in the BCS title game. Vegas has set the over/under for both teams at 75 points. Armstead in particular is shaping up to be a prized commodity among pro scouts. Oregon State’s, maybe, but not Florida State’s. A handful of fifth-year seniors are still around who redshirted that year. Titus’s Top 12 NCAA Power Rankings: Damn, That Gonzaga Bench Is Deep!